It honestly still surprises me how invested I can be with books. While this book wasn't the best thing I ever read, it was still so good and kept me reading even though it's incredibly long and probably doesn't need to be. These books are kind of like my guilty pleasure, but I'm actually not that guilty about enjoying these. 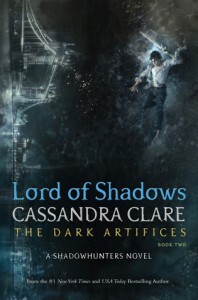 I have always really enjoyed Cassandra Clare's writing style. There are such vivid descriptions and her world is very imaginative with so many parts, but it works so well and doesn't feel like it's too much. I also love that the emotions the characters feel are so real and believable. It's so real that it's easy to feel the happiness and sadness the characters are feeling. For the most part, I absolutely adore the characters. I love how strong Emma is, but how she's also vulnerable in ways that make her human. She isn't an untouchable heroine that's hard to connect to because they might be too perfect and I really enjoy that. Julian has to be my favorite character by far though. His love for his family is so sweet and I just feel so much for him. The fact that he can be sweet, but also ruthless is what really makes me love him though. Another thing that I really enjoyed about this book was the character development for Livvy, Ty, and Kit. In the last book I had complained that the siblings, except for Mark and Julian weren't developed enough. I'm so glad that Kit's point of view was introduced because Livvy and Ty became more central to the plot and less like background characters that were there only when it was convenient. The friendship that develops there is honestly one of my favorites and seemed to work so well. I really love Julian relationship with Emma throughout this series, but I did get frustrated by them a lot for the majority of this book. Neither one will talk to the other about their feelings because they believe the other doesn't feel the same way and it's just so frustrating. I didn't understand why Emma couldn't tell Julian what she learned from Jem at the end of Lady Midnight. Why she thought that was a good idea I'll never understand. I wish there had been more of Cristian in this book. She played a very central role for the first half of the book, but she gradually seemed to become less important as the story progressed. I was really interested in her relationship with Mark and Kieran, so I hope there's more about them in the next book. I also thought that this book was very long and probably didn't need to be as long as it is. It wasn't really slow or boring, but there were a few parts that didn't seem entirely necessary. Overall, I really enjoyed this book and I will definitely be looking forward to the next one, but apparently that one doesn't come out until 2019. Why is it so far away? That wait is going to be like City of Heavenly Fire all over again. Of course this book had to end on a cliffhanger too.